Colten’s Spina Bifida defect is around L4 (we’ve been told L3-S1 by various medical professionals). He has strong quad (thigh) muscles, strong hip flexors, weak hamstrings and weak hip extensors. He appears to have some movement in the left lower leg as well – I don’t know this muscle name but basically he can ever so slightly, on occasion, flex his left foot upwards. He doesn’t push it back down and doesn’t seem to have any movement of the right lower leg. Sensation is a little hard to determine yet since he cannot tell us what he feels. We can (and do) pinch parts of his legs and feet and toes looking for a reaction from him, and assume that if we get three identical responses in a row to the same spot, he has feeling there and it’s not random movement. So the results are scattered and it’s not something we worry too much about at this point anyhow. With all the nerve issues that exist due to the Spina Bifida Myelomeningocele, blood flow is also reduced to the lower extremities. So his feet are often cool to the touch. Why am I explaining this? Because his feet are always cold yet we rarely put socks on him and for some reason, I feel the need to explain WHY. Often times, putting socks on Colten means that either his feet will stink more or his feet will be even colder. The stinkiness, from what we can guess, is because his feet are trapped in warm booties and because he cannot move his toes, toe jam just collects in there and stinks up. The fact that his feet can get colder in socks seems to be from even the slightest extra pressure around the lower part of the leg – it reduces the blood flow that much more to the feet. So instead of being warm when we take socks off, his feet are actually colder! Why not just get looser socks? Because they just don’t stay on! His feet point inward and when he does move his legs around, his feet just kind of flop and hit the opposite leg and cause loose socks to just come off. So we just leave well enough alone. They aren’t FREEZING, even though they do look quite purple, as Parker noticed. And so when you see his chilly feet without socks, now you know why. Plus without socks, we can give stronger sensory input to his feet, just in case a nerve somewhere in there decides to wake up, or grow, or something! 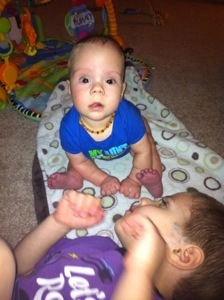 You can tell a little in this picture how purple his feet look… Coincidentally, Parker has on his favorite tshirt. Purple of course! The next two show both the purple color, then the lack of circulation. Right before I took the second picture, I pressed on the bottom of his foot with my thumb. I waited quite a few seconds then took this picture. The coloring takes a while to come back. Speaking of feet, onto a physical therapy update! EarlyOn continues to send us our wonderful PT, April, every two weeks. To the house. Have I mentioned how much I love this?! She usually comes when the other two boys are napping so it works out nicely to be able to do Colten’s appointment without interruption. Colten is 4.5 months old and is starting to sit with a bit of stability (hands in front of him for balance), keeps his head upright better, and can roll himself crudely from belly to back (easier roll). He is pushing up with his arms and trunk when on his belly and when given assistance with his legs and pelvis, can get his trunk and head to complete a back to belly roll (harder roll). She is very happy with those movements and the strength he is exhibiting in his trunk. All of those movements are age-appropriate. He is such a people-lover that he is far more interested in interacting with faces than toys. Not a bad thing, just a “noted” thing. And he is obsessed with his fingers in his mouth. So much so that between that and the people-loving, he has no need to unclench his hands, spread his arms, and grab at toys. This is a little behind the game in what she would like to see. He just doesn’t express much interest in doing anything with his hands except eating them. So we’ll continue to introduce some different textures to see what might entice him to open up those hands. So far he seems to enjoy crinkly baby books. One of the things we spoke about at the appointment on Tuesday was sitting. As we’ve been working on that skill with him a little bit each day, I noticed that when sitting he really doesn’t move his legs at all and as soon as he tries to move more upright, he tips backwards and loses all balance. Watching him, something seemed different about how he tipped and I realized that when we are seated, legs out in front of us, and we tip back, we react by tightening our legs and digging our heals into the floor a bit. (Go ahead, try it, then keep reading…) Colten does not seem to have the muscle development (at least yet) to do this heal digging, so it is imperative that we build a strong, solid, balanced core to help him offset the unstable foundation under his trunk (the legs). When Colten rolls from back to side, in preparation for rolling back to belly, often he gets his legs caught under each other, and as he attempts to roll further, he engages his muscles throughout his core. However, he also activates his hip flexor muscles, which pull the legs and knees upwards and prevent him from rolling further. So we need to work on helping him straighten those legs out flat so he can continue through the roll, and use his trunk to get his body over since his hips and legs aren’t helping to propel the motion. Right now, we are very happy with how he’s developing. He’s on track for his age in most areas and even a little ahead in some others. We have a few things to focus on and we know it will get tougher as he gets older. We love where he is at right now though! It is funny how this is our third child and I feel like I am learning so much more about baby movement with him than the other two. Every move is dissected and evaluated. With the other two, we really didn’t teach them to roll or sit or crawl – they eventually just did it. Now, we have to step back and help his body learn how to move or adapt in smaller ways so that he can eventually learn how to do the larger movements himself. This entry was tagged myelomeningocele, physical therapy, spina bifida. Bookmark the permalink. For what it is worth, I could identify with the cold feet and sans socks. Now that I have neuropathy in my feet, especially the bottoms and toes, I’ve lost the feeling of having cold feet. Actually even before that I would often wear sandals without socks even on the coldest days. Anyway, once I had the neuropathy, I found that my feet were colder in bed with socks on than they were without them—but I don’t have stinky feet! Toe jam? Never heard of that before. Fascinating. I continue to be amazed by the four of you and your wonderful, even-handed, but overflowing heart-filled care for Colten. Glad to hear that there is more that is “normative” for his age development than problematic. Part of the challenge, don’t you think, is to keep focused on the positive and not to view him as a problem to be solved—more a mystery to let unfold. Anyway you all are doing great and continue to be in my thoughts and prayers always. Gordon said a lot of what I was thinking and better. I have the cold feet too and that has always been that way. Even though I wear socks, wrapping my feet in a fleece blanket is better, if it’s not real cold. (It was 25 this past week at night). 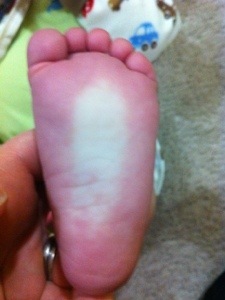 I have noticed Colten’s purple feet and glad Parker likes that color! Glad you are learning so much through Colten, teaching us and showing us your gift of writing! You explain things so well also Katie, so you have the teaching gift also, like Richard!